Africa is a large continent with a diversity of culture and in one sense ‘African Cinema’ seems a misleading term. Yet, strip out Egypt and South Africa, countries with established film industries and links to the international cinema business in other parts of the world, and the rest of Africa shares many common features. The possibility of films made by Africans in Africa didn’t really arise until the process of decolonisation was well underway in the early 1960s. Anglophone and Lusophone (Portugese speaking) Africa were slow to move into feature film production. Anglophone Africa has been restricted in the development of film culture because the British colonial powers made no attempt to promote film as art and concentrated solely on educational and documentary filmmaking. At the same time, the limited spread of entertainment cinema remained in the hands of American and other foreign distributors. It has been across the Francophone countries of North Africa and West Africa that film culture has developed. French colonial policy included attempts to promote an interest in film as art and following independence, strong cultural ties with ex-colonies have seen support for filmmaking in Africa. This support has been expressed through training opportunities, access to post production and distribution outside Africa. As a result, Paris has long been a major centre for African film (and popular music). As might be expected, the relationship between African filmmakers and the ex-colonial power have not always been straightforward. As soon as Sembène Ousmane’s Borom Sarret appeared in Senegal in 1963 and was hailed as sub-Saharan Africa’s first feature (albeit a short feature), African filmmaking became political. In carving out a space within which to make ‘African’ films, many of the new directors found themselves at odds, not just with the French, but also with their own ‘neo-colonialist’ governments and many films were banned. The new rulers of countries like Senegal were sensitive to criticism and seemingly preferred the local audience to see Western or Asian action films rather than contemplations on life at home. As a result, filmmakers from different countries found strength in getting together in a ‘pan-African’ movement FEPACI (Fédération Panafricaine des Cinéastes) and later the Film Festivals at Carthage in Tunisia and Ouagadougou in Burkina-Faso. Through these kinds of initiatives, filmmakers have been able to see their films, sometimes banned at home, screened in other countries and for outside film journalists. This collective effort has meant that some of the poorest countries in the world, notably Mali and Burkina-Faso, have produced world-class film directors. Cissé is a good example of a filmmaker who received his training abroad. Initially a photographer, he won a scholarship to go to the Soviet Union to train as a projectionist but switched to film direction, remaining seven years. In 1970, back in Mali he worked for the Ministry of Information on newsreels and documentaries but Den Muso, his first feature in the local language, Bambara, was banned by the Malian authorities. This tale of a young ‘child mother’ eventually led to an intervention, on Cissé’s behalf, by the Head of State. Cissé had further problems with Baara in 1978. He described this film as “. . . a description of the problems of a working-class in the process of formation” (Leahy 1988) and saw the central issue as the peasantry and the ways in which it might become politicised. Finye appeared at the right time to benefit from a change in French cultural policy following the rise to power of François Mitterand in 1980, receiving support from the French government for distribution in France where it played at various cinemas over a six-month period. Through this exposure, Cissé gained something of an international reputation and in 1987 his fourth feature Yeelen won a prize at Cannes and was widely distributed internationally. His fifth feature, Waati appeared in 1995. The film tells the story of a love affair between two teenage students, the daughter of an Army commander and the grandson of a village elder. This narrative at once picks up on the central issues of life in Mali and many other African countries – questions about the effectiveness of administration and lack of democracy in states run by military regimes and also the clash between ideas of ‘modernity’ and ‘tradition’. The film also marks a shift taking place between ‘social realism’ – recognisable from its European roots – and a more ‘metaphysical’ cinema, alert to the ideas and images of African culture. So, while the military authorities are rounding up students in scenes familiar from European or American films, the hero’s grandfather is communicating with the spirits in the trees. According to Manthia Diawara (1992) the social realism of African Cinema means something slightly different than it does in Europe. Again the emphasis is on social issues, but these are to be seen from the perspective of ‘marginalised’ characters such as women and children, rather than the elites of modernised society. The films draw on popular cultural forms such as song and dance, popular theatre and the oral tradition and uses melodrama, comedy and satire to expose the corrupt nature of the modernising process. The leading figure in this movement was Sembène Ousmane from Senegal, but Diawara claims both Baara and Finye as social realist films. 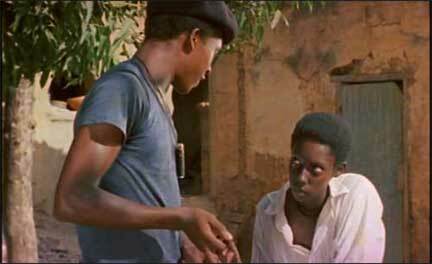 Crucially, the attraction of social realist films is that through popular culture they speak more directly to African audiences – perhaps this is why so many of them were suppressed by domestic authorities in the 1970s. Just like the neo-realists in post war Italy, African filmmakers, trained in France and conversant with the great works of international cinema, found that at home they experienced not only the difficulties of raising finance and getting access to suitable equipment, but also a complete lack of trained film actors. The leads in Finye came straight from high school. It is important to note that although the social realist films are ‘anti-modern’ in terms of criticising the new elites, they are progressive in aligning themselves with ideas that criticise aspects of traditional life that deserve to be changed. Thus they support potential changes in the status of women and their opportunities in society – as in the case of Batrou in Finye. In Cissé’s next film, Yeelen, the ‘African’ narrative becomes the centre of the film and Cissé has been seen as a leader in what has been called the return to source movement. It should be noted, however, that rather than this being a backward step, some (often African-American) film scholars have seen this as a parallel movement to postmodernism in the West – as essentially an ‘anti-realist’ movement in which directors like Cissé have sought both new ways to represent African stories and new histories of Africa before the European colonisation. Although this is a specifically African issue, there are aspects of the debate about realism and anti-realism which will be familiar. Cissé himself has said that he thought that he needed to find a new form of cinema to escape the censorship attracted by his overtly political and didactic approach. This entry was posted in African Cinema and tagged neo-realism. Bookmark the permalink.